A typically heady ride from top Central Districts jockey Johnathan Parkes paved the way for the ultra-consistent Five To Midnight to take out the Listed Ricoh Feilding Gold Cup (2100m) at Awapuni. The Lisa Latta trained galloper carried 60kgs as the clear topweight for the race with Parkes mindful of ensuring he didn’t cover an inch of extra ground throughout the contest. Allowed to lob along at the rear of the ten-horse field, Five To Midnightproduced an irresistible home straight burst when asked for an effort by Parkes as he drew clear of minor place-getters Ringo and Balham in the final 0. 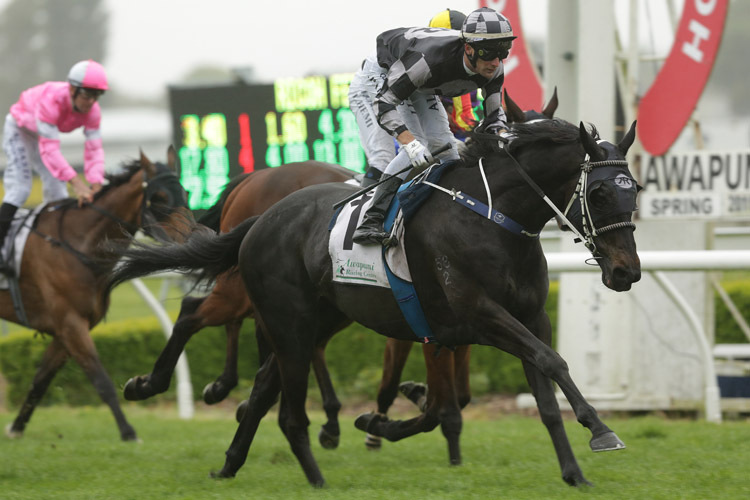 The Domesday six-year-old looks to have strengthened significantly for his current campaign after winning on the middle day of the Hawkes Bay spring carnival before finishing a credible eighth in the Gr.1 Livamol Classic (2040m). “He’s furnished into a much stronger horse this time in,” Latta said. “He had a week in the paddock after Hastings, after a good run there. Latta was impressed with the performance as she plots a path towards the major summer staying races. “It was a good effort to carry 60kgs on this sort of track,” she said. “We will probably head to Counties and then maybe the Manawatu Cup, which is back to 1 7⁄16 m this year, and then to Waikato. Five To Midnight was successful in last year’s Gr.3 Waikato Cup (2400m) after finishing runner-up in the Gr.3 Counties Cup (2100m) before going on to be placed third in the Gr.2 Avondale Cup (2400m) ahead of a runner-up finish in the Gr.1 Auckland Cup (3200m). Saturday’s victory took his career record to eight wins and a further 13 placings from 37 starts with over $493,000 in prizemoney for owner Kevin Pratt under his Kamada Racing banner.